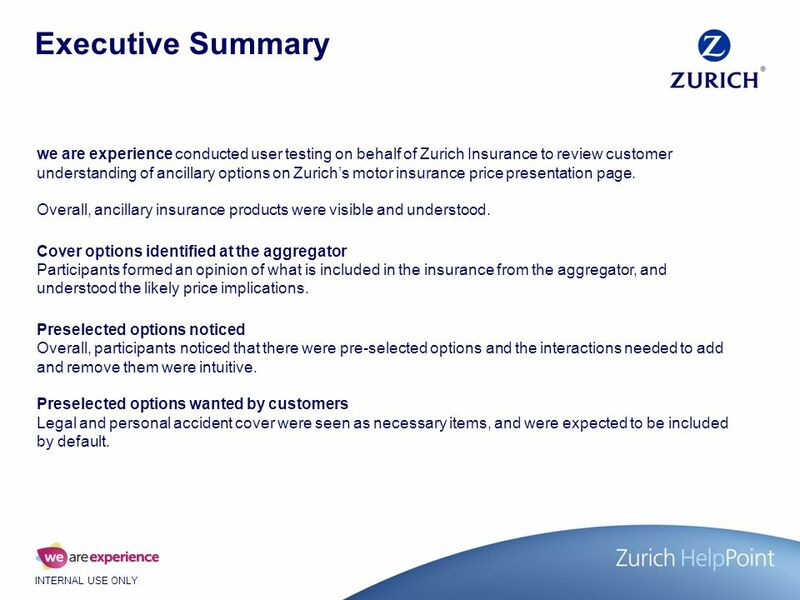 INTERNAL USE ONLY Ancillary Motor Insurance User Testing Report V2.2 Richard Johnston May 2012. 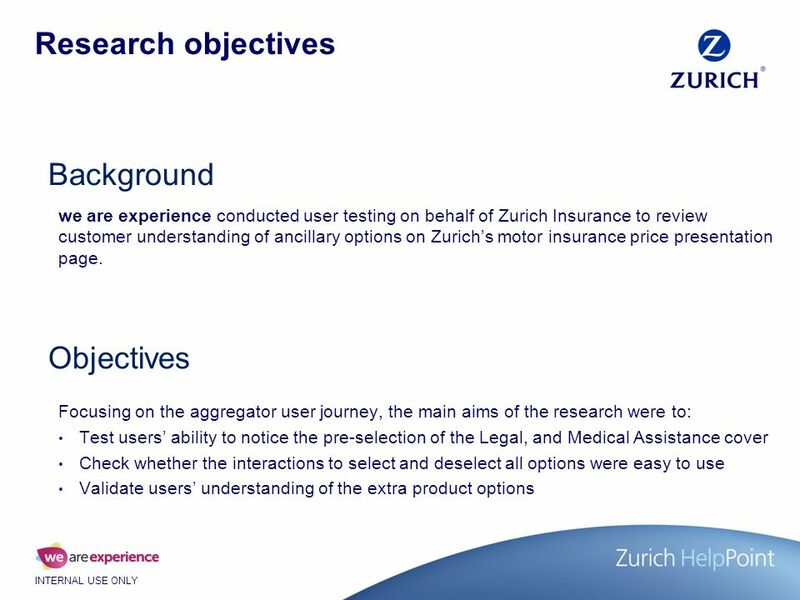 2 INTERNAL USE ONLY Executive Summary we are experience conducted user testing on behalf of Zurich Insurance to review customer understanding of ancillary options on Zurichs motor insurance price presentation page. 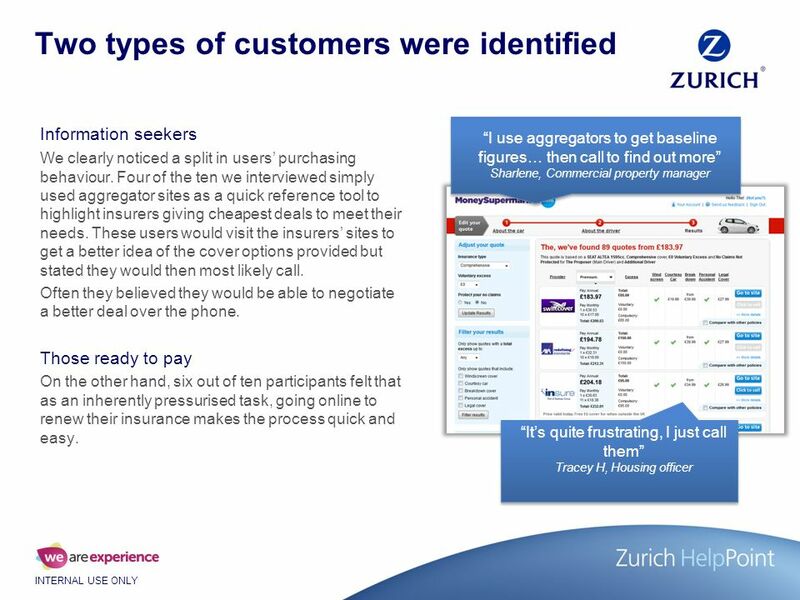 Overall, ancillary insurance products were visible and understood. 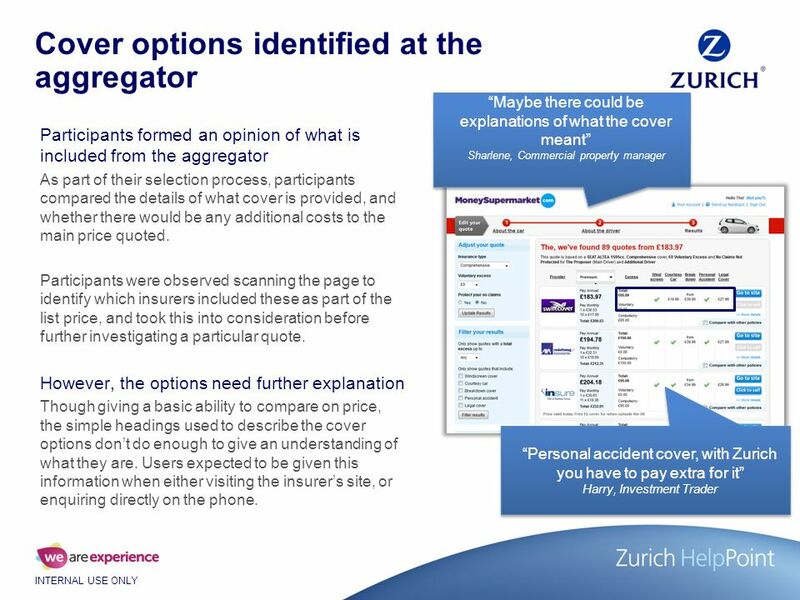 Cover options identified at the aggregator Participants formed an opinion of what is included in the insurance from the aggregator, and understood the likely price implications. 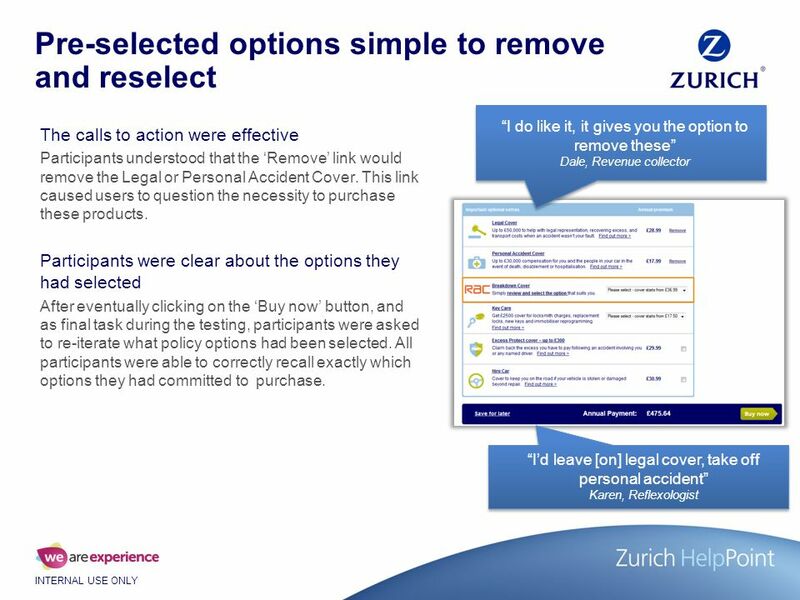 Preselected options noticed Overall, participants noticed that there were pre-selected options and the interactions needed to add and remove them were intuitive. 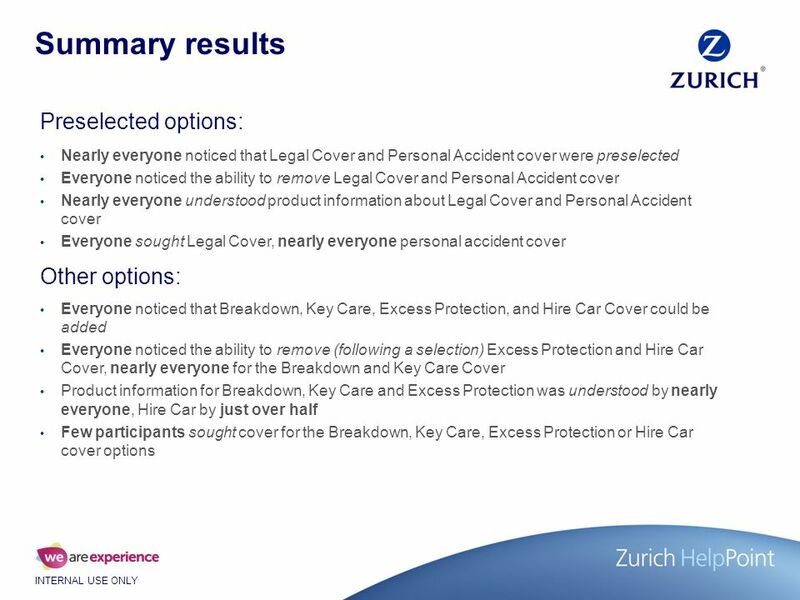 Preselected options wanted by customers Legal and personal accident cover were seen as necessary items, and were expected to be included by default. 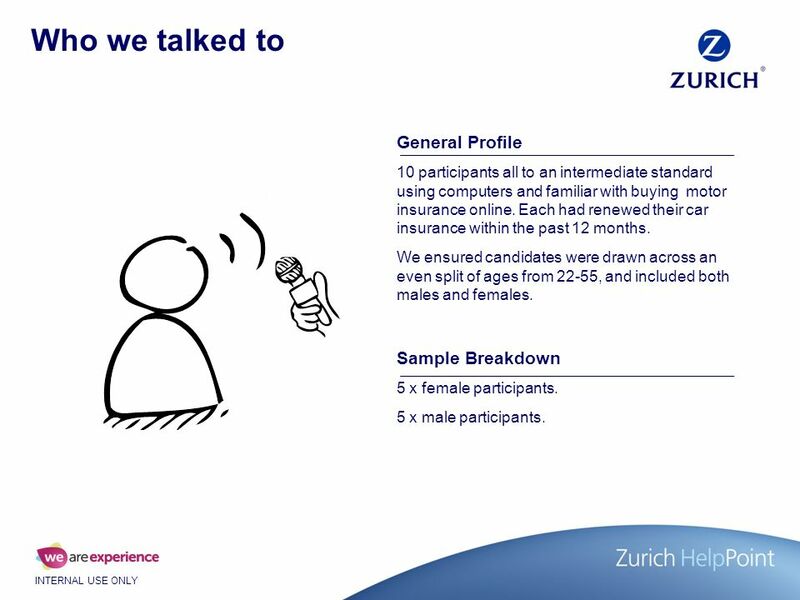 5 INTERNAL USE ONLY Who we talked to General Profile 10 participants all to an intermediate standard using computers and familiar with buying motor insurance online. 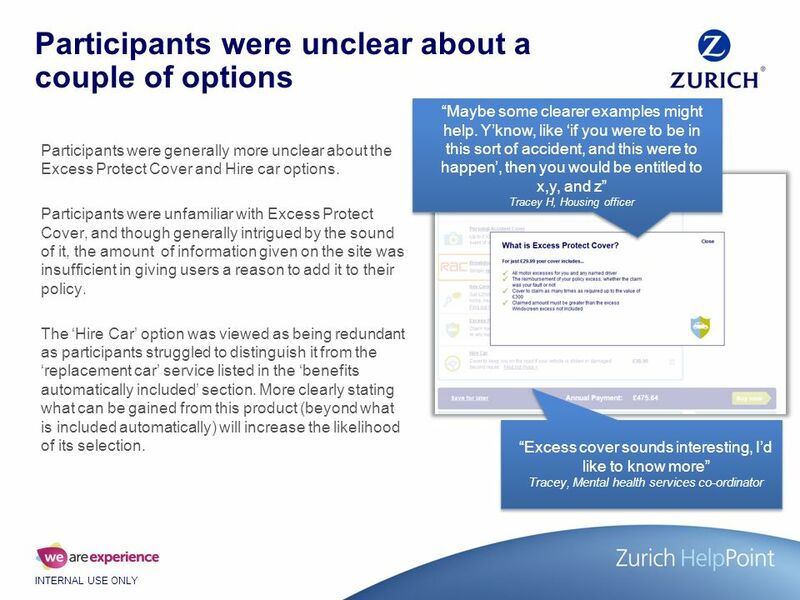 Each had renewed their car insurance within the past 12 months. 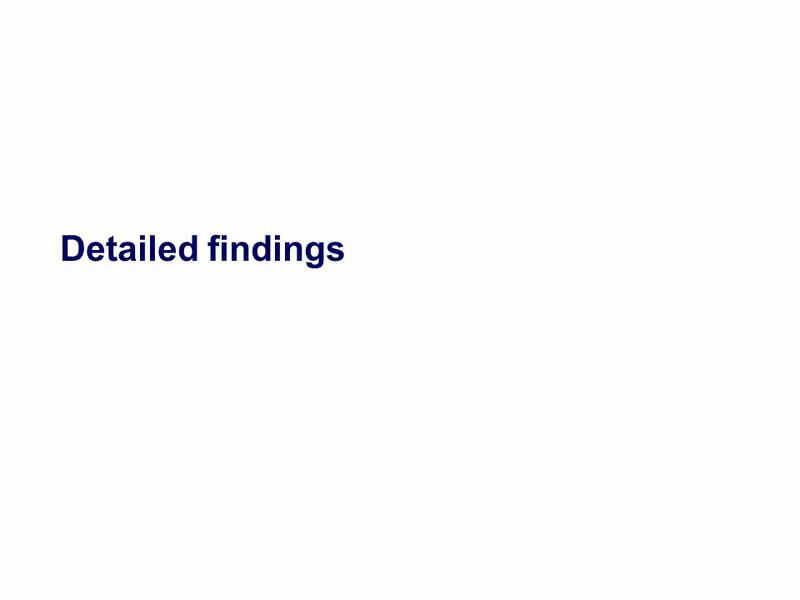 We ensured candidates were drawn across an even split of ages from 22-55, and included both males and females. 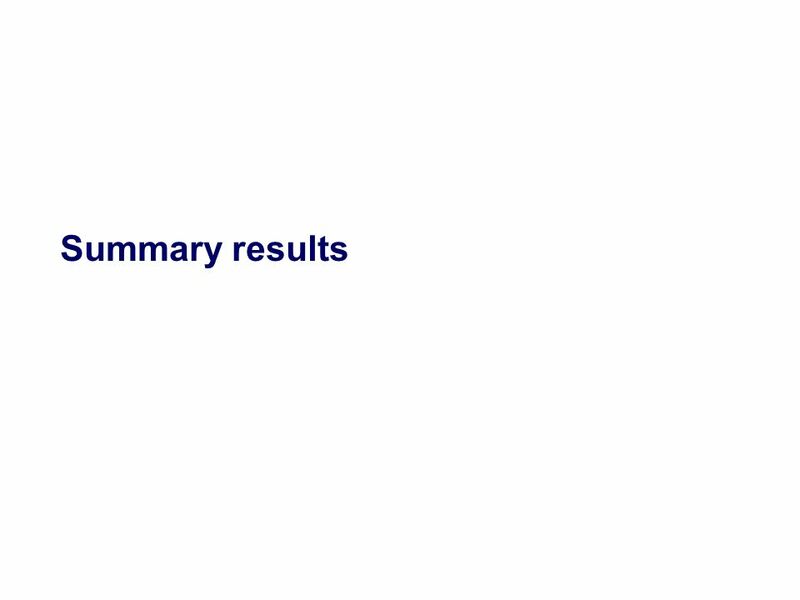 Sample Breakdown 5 x female participants. 5 x male participants. 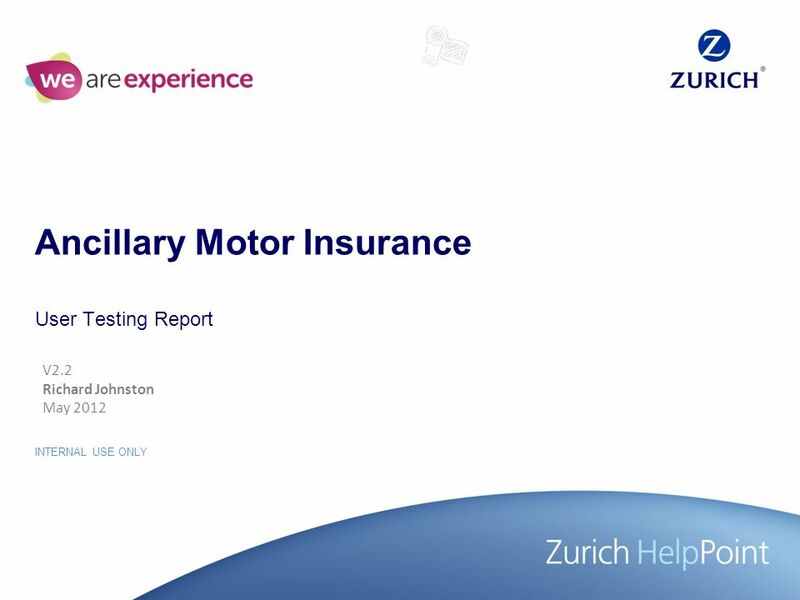 Download ppt "INTERNAL USE ONLY Ancillary Motor Insurance User Testing Report V2.2 Richard Johnston May 2012." 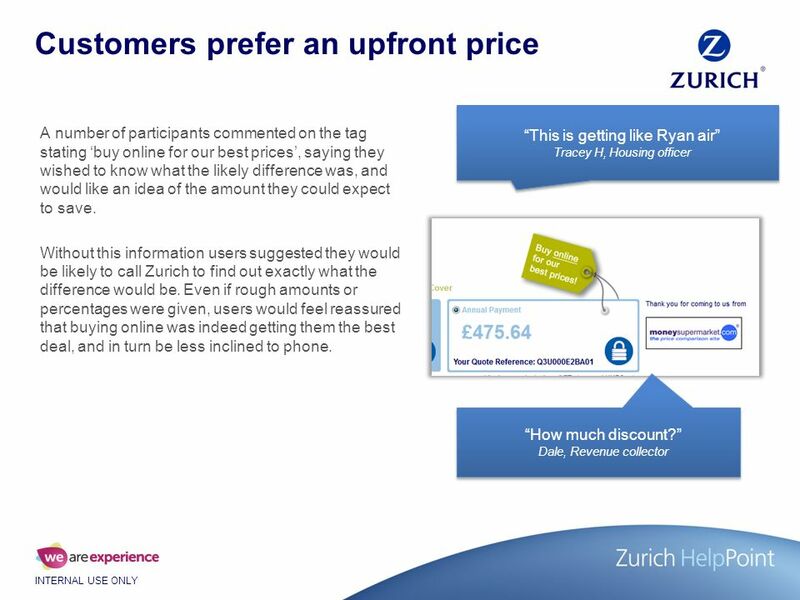 Customer Acquisition – Energy. 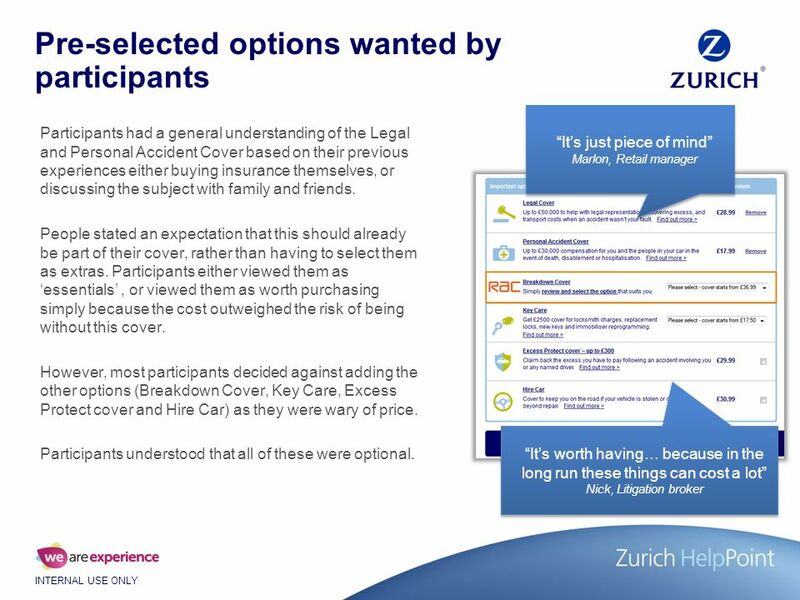 Customer Sources 1.Yourself 2.Prospects who do not get involved with the opportunity 3.Everyone Else – Warm Market. Processing Your Loyalty Order Online. Table of Contents Click for direct link to your preferred topic: Process your Loyalty Rewards Order TODAY Edit your. Getting the most out of your business Its an ever evolving industry in an ever changing world. So what will tomorrow bring? Getting the most out of your. CITIZENSHIP, MATHS AND ICT Unit Overview Financial Literacy. 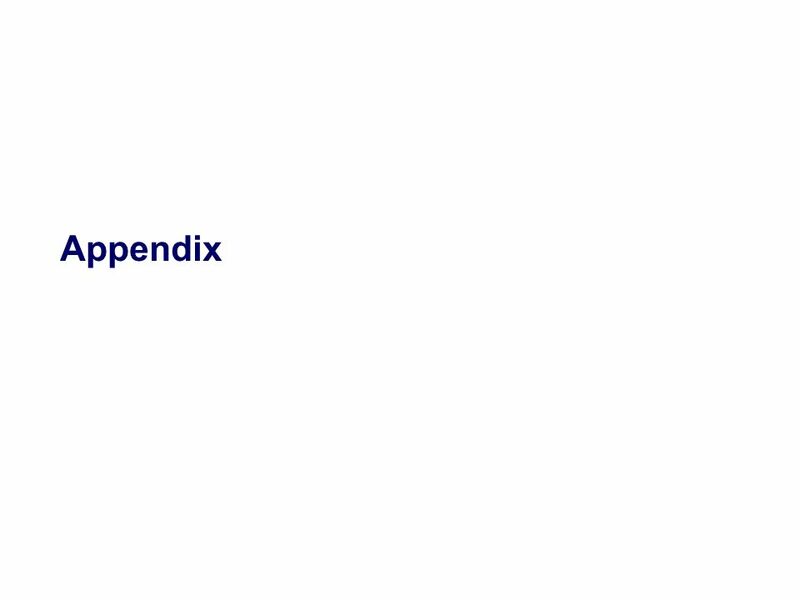 GP Patient Survey Mouse-click your way through step-by-step instructions Software Installation Guide. 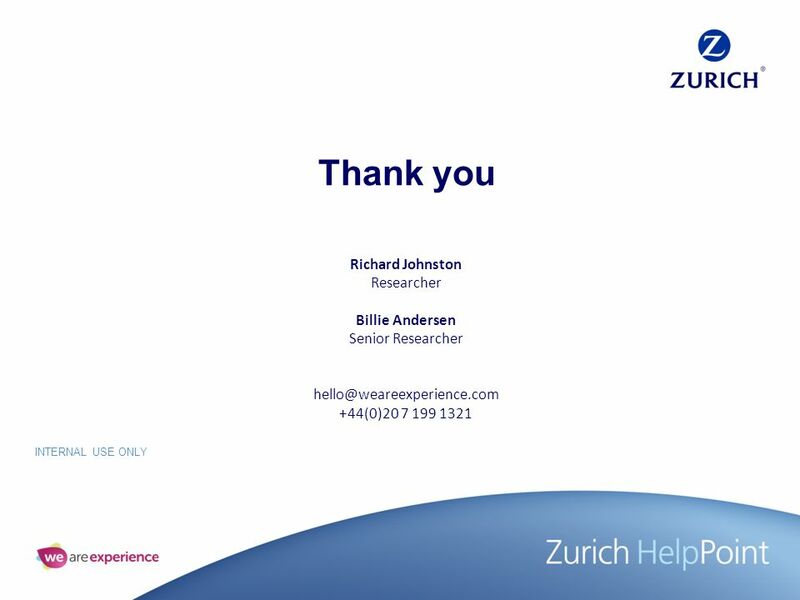 E-Portfolio July2014 Managing Multi-source Feedback. 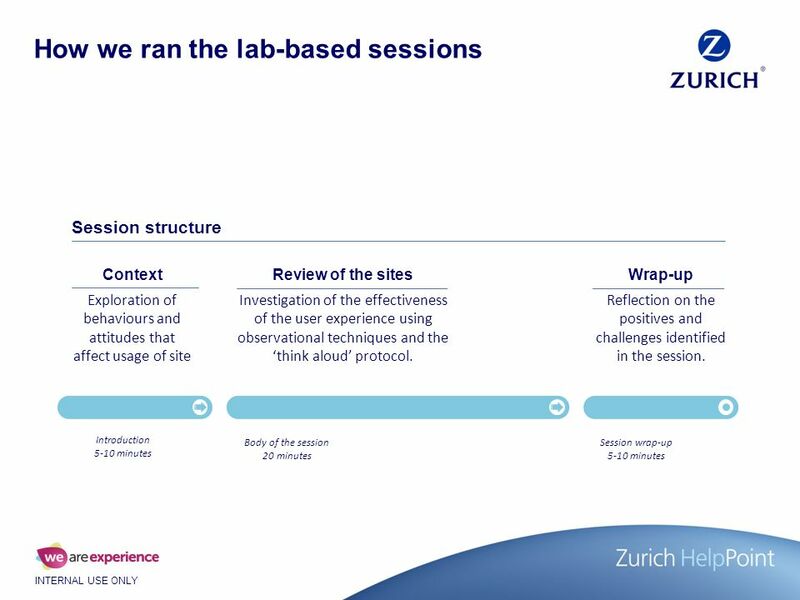 SUCCESSFUL SERVICE DESIGN Turning innovation into practice READ MORE... 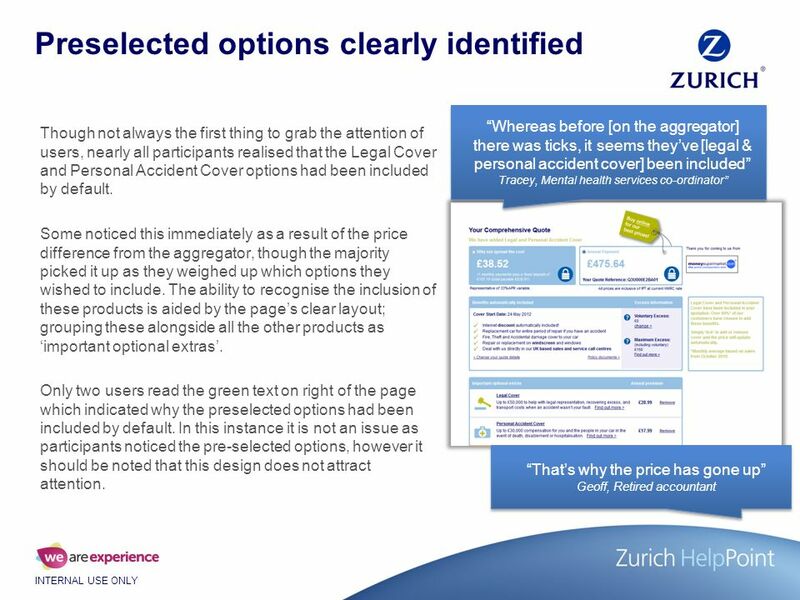 USER GUIDE Read the “User Guide” to find out more about this site START Ready to. Service Users subject to s. 41 of the Mental Health Act Their views of risk and risk assessments Jeremy Dixon. 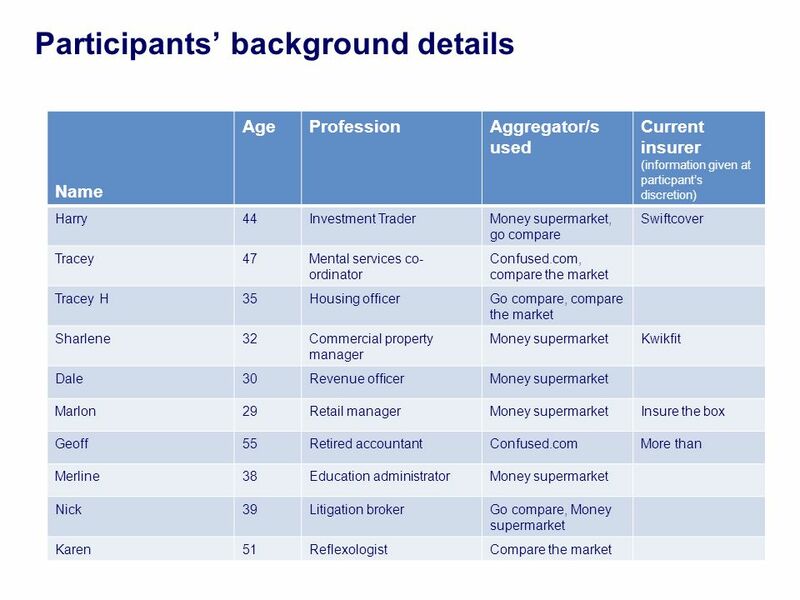 Consumers & Online Privacy: Agenda Background and objectives General attitudes to the internet Attitudes to online data and privacy Attitudes to. WELCOME TO THE ANALYSIS PLATFORM V4.1. HOME The updated tool has been simplified and developed to be more intuitive and quicker to use: 3 modes for all.